The year started in a hectic way for Elvis: on 6th January he got a sympathetic court hearing. They ruled that the woman who had brought the paternity case against him during the last Las Vegas season should give blood in order to show whether the case was an unfounded attempt to claim damages. Three days later Elvis was once again in the headlines but this time the reason was of a more pleasant nature: on 9th January the National Junior Chamber of Commerce published its list of the 10 most prominent men in America during the last year, and Elvis' name was on this exclusive list. Elvis opened on January 26th. Elvis had chosen the composition "Also Sprach Zarathustra". This was a stroke of genius; this powerful opus created an almost supernatural atmosphere as it filled the entirety of the competely darkened showroom. During this season too, Elvis failed to avoid becoming ill. Some of the shows were naturally characterised by the fact that Elvis wasn't feeling well, and some, were also extremely short - around half an hour. But Elvis gave some really good shows. Most striking new song is the crooner "The Impossible Dream". This song is used as the closing song for some time - instead of "Can't Help Falling In Love". The press is very positive. The audience is wild of enthusiasm. 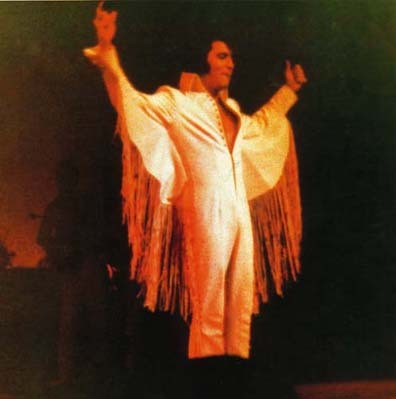 On January 29, Elvis is wearing the Fringe Suit, as he did during one of his Las Angeles concerts in 1970. "Snowbird" is a song which is perfectly done by Elvis. Songlist January 29, 1971: That's Allright - I Got A Woman - Love Me Tender - You Don't Have To Say You Love Me - Sweet Caroline - You've Lost That Loving Feeling - Polk Salad Annie - Johnny B. Goode - Something - Heartbreak Hotel - Blue Suede Shoes - Teddy Bear - Hound Dog - Snowbird - The Impossible Dream.